Bengaluru/Mumbai: In a major development in the politics of Karnataka, B S Yeddyurappa has been sworn in as the Chief Minister of the state after his party became the single largest party with majority votes. The vote of Congress and JD(S) which has formed an alliance is 117, more than the magical number of 112. BJP has won 104 seats. Soon after B S Yeddyurappa took oath as the Chief Minister of Karnataka on Thursday morning after the Supreme Court in a rare post-midnight hearing ruled out that it won’t stop Yeddyurappa swearing-in, Congress MLAs and leaders held a protest outside Mahatma Gandhi’s statue in Vidhan Soudha. 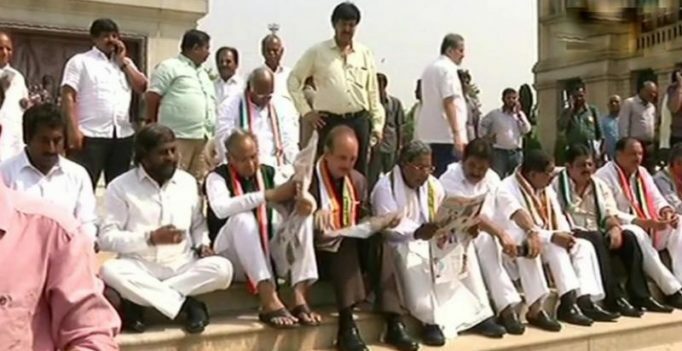 Congress lawmakers, accompanied by Ghulam Nabi Azad, Ashok Gehlot and former chief minister of Karnataka Siddaramaiah were protesting against B S Yeddyurappa’s swearing in as Chief Minister of Karnataka.